After Jammu and Kashmir Chief Minister Mehbooba Mufti hailed the former prime minister Indira Gandhi as an ideal representative of the India, the Congress on Saturday stated that they are confused on the former's dubious statement and added that either should either praise Prime Minister Narendra Modi and or the Iron Lady. Speaking to ANI, Congress leader Mani Shankar Aiyar said, "I'm fed up with Mehbooba Mufti's statement either on the National flag or calling 'India is Indira Gandhi'; because as far as I know she treats Prime Minister Modi as her idol. I don't understand the comparison here; it totally seems very vague and weightless. Further lashing out at Mufti, Aiyar stated that her remarks come only because she has power and misuses it. "I have many a times questioned her (Mufti) that her statements and remarks towards the country have been taken to notice. But the only difference between us is you are in power and I'm not so that does not allow you to assert whatever you want," he said. Earlier in the day, hailing former prime minister Indira Gandhi as the ideal representative of the India that she envisions, Jammu and Kashmir Chief Minister Mehbooba Mufti said ' India is Indira Gandhi' for her. "When I was growing, Indira Gandhi represented India for me. Maybe some people won't like it, but to me, India is Indira Gandhi," she said, while speaking at a Kashmir event. However, Mufti was all praises for 'the man of the moment', Prime Minister Narendra Modi, who, she believes, can be the true harbinger of peace and stability in The Valley.
" Prime Minister Modi has the potential to become the man of history and his leadership is an asset which needs to be harnessed. Our hopes are pinned on him to work together and bring Kashmir out of the mess," said Mufti. Saddened by the portrayal of Kashmir and India as separate identities by the media, Mufti highlighted that the country is being misrepresented, adding that the society should be more welcoming to the idea of Kashmir and its natives. "Kashmir is a mini India within India. We are a diverse state with all kinds of multi-diversity of religion and everything. Opposing religious divide, the state had aligned to a more secular and accommodative India where Hindus and Muslims pray together at a shrine and statues of Hindu gods are being made by Muslim artisans," she said, urging that the sentiment of 'azadi' needs to be replaced with a better idea. 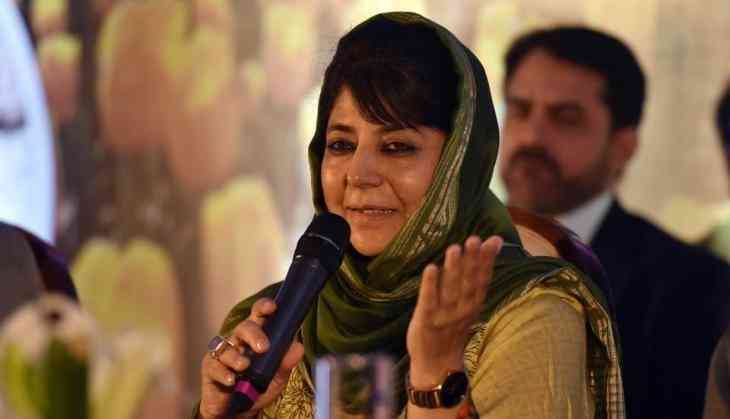 Furthermore, Mufti while backing the people of her state vehemently denied the idea of revoking the state's special status granted as per Article 370 of the Indian Constitution, and said the flag and the special status were a crucial element of preserving the Valley's culture and heritage.